Find You in the Dark will be available June 19, 2018. 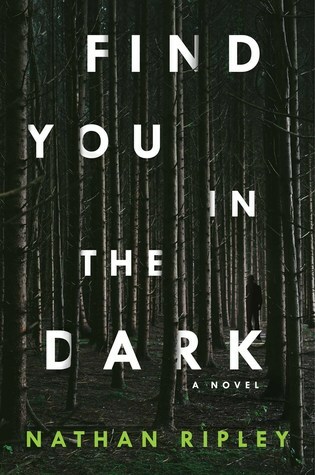 Comparisons to Dexter and to Joe made me pretty excited to read Find You in the Dark, but as with such other comparisons, I was left a little disappointed. I had a really hard time getting into this book. While I did find Martin to be an interesting character, every time the POV shifted away from him I was kind of bored. I thought the pacing was really slow. I was expecting a good twist or two, but didn’t really find anything surprising. I didn’t find it suspenseful until the final chapters and by then it was kind of too little, too late. As I mentioned above, I found Martin to be an interesting character (though not as compelling as the characters alluded to in the synopsis). I also liked one of the cops, Chris. I kind of hated all the other characters, though. Martin’s wife was super unlikable and I completely detested Sandra, the detective. She was abrasive and treated everyone around her horribly and I just cringed every time we got her POV. Overall, I found Find You in the Dark underwhelming. I’m adding a half star to my original rating because I did enjoy the main character and the ending of the book picked up a lot. But, for the most part, I found the supporting characters very unlikable and the story itself was just kind of dull to me. Sounds a little disappointing. At least the characters were interesting! Great review Stephanie. Thank you! Yeah, it wasn’t all bad, but it definitely disappointed me. Thanks! Sandra was the worst. I’m glad you found more to enjoy about it than I did, though! I’ve seen a few really favorable reviews on this one, so you are in good company. Oh wow. I was expecting higher praise because the blurb sounded so good. I might have actually read this one until I read your review. I trust your judgement, so I’ll be passing on this one. Great review! I had high hopes for it, too, but it just didn’t live up to them. I don’t think you’re missing out by skipping it, but I have seen some good reviews on it, too, so you never know.